The Best Series is a fresh and innovative way to introduce and study genre-specific literature in your classroom. Students can explore and gain appreciation for exceptional and diverse writings in nonfiction, poetry, plays, short stories, and selections from novels. This enriching series strengthens students' reading and writing skills and literary techniques. Outstanding literature. Opens students' minds to a magnificent collection of genre-based literature. Diverse multicultural authors. Introduces readers to classic and contemporary works. Convenient multiple levels. Enables readers to appreciate literature at their own interest and reading levels. In-depth literary lessons. Gives students insight into the techniques writers use to create their pieces. Increased reading proficiency. Results as students work with major reading and interpreting skills. Affordable prices. Makes this outstanding series available at nonbasal prices. Books are available in both hardcover and softcover editions. Students explore the special way poems use words, sounds, and images. 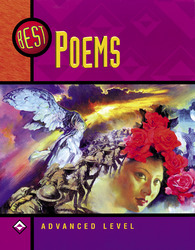 The selections help students gain the skills and understanding to appreciate great poetry and learn its language. Readers learn how writers construct their poems, what the major elements of poetry are, and what techniques are used.